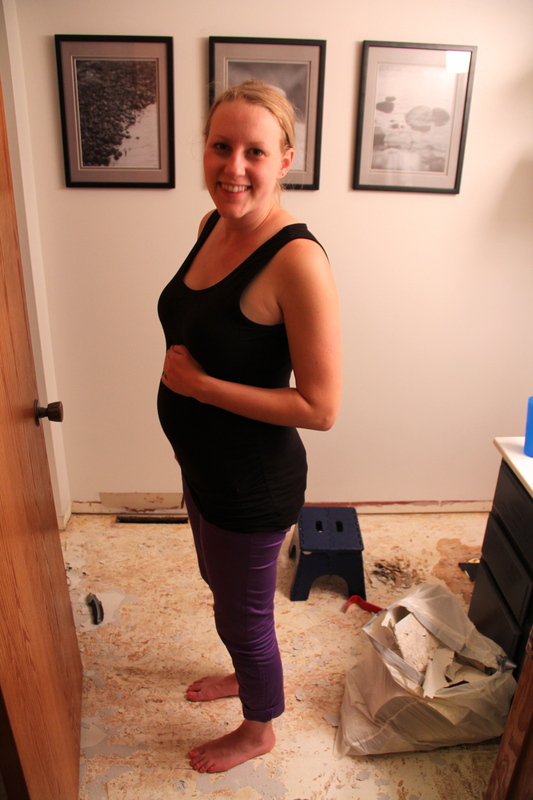 In my second trimester I decided that I needed to accomplish one house project while I had the energy to do so and before we went into full-blown baby mode. I knew if I didn’t get something done before we started on the nursery, that it would never get done. 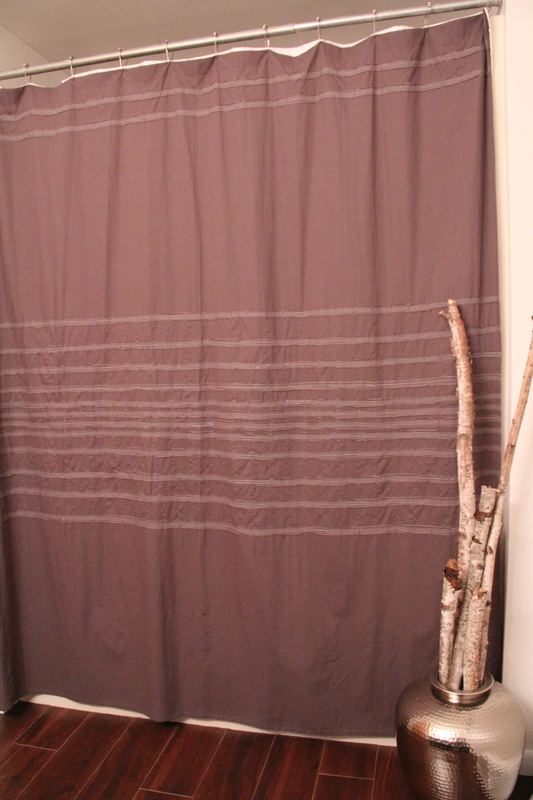 So we were wanting to give our bathroom a little facelift from the ground up. 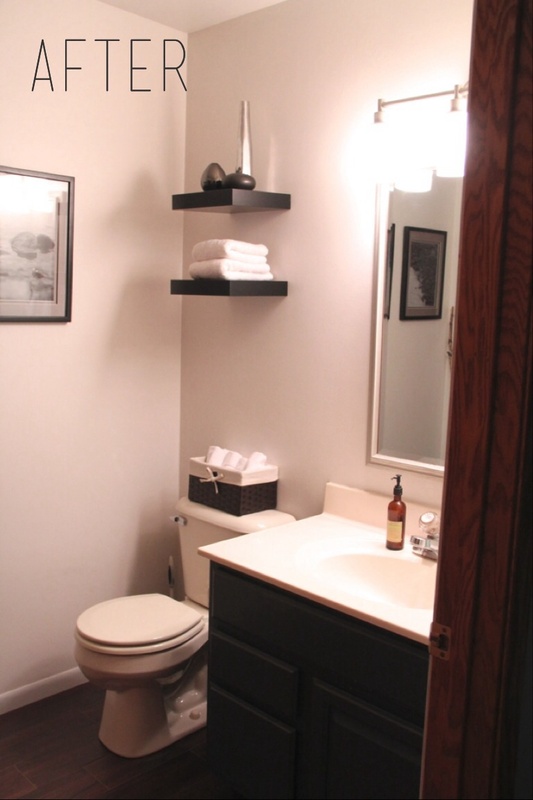 When we moved in, the bathroom was all oak wood and very outdated. 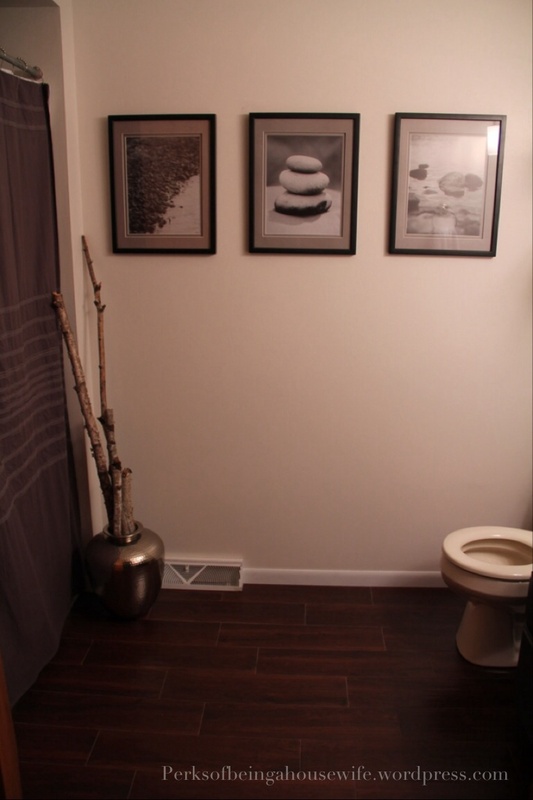 I decided to use what we already had for decor until we redid the bathroom. Lets just say- it was lacking vision and function. Check out the pics before the remodel. Sorry they are not the best of quality, but it’ll still give you the idea of what it looked like. It had some very outdated linoleum for flooring, oak trim and tan walls. 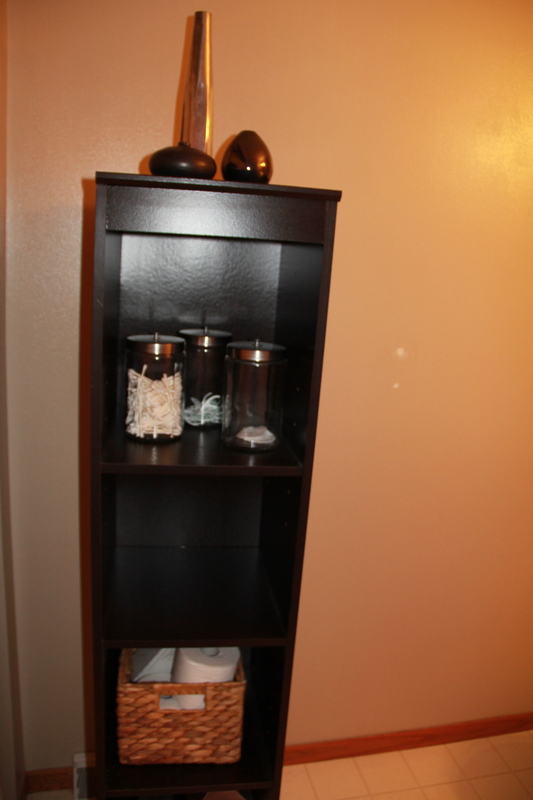 Again, I had just used what we had so I put this tall awkward shelving unit in here to give some storage. 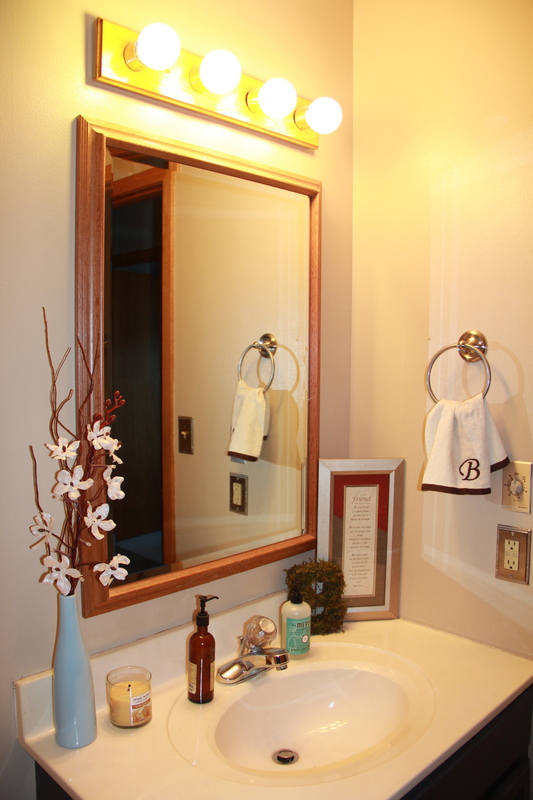 So there you have it…complete with the classic standard oak light and mirror. So we decided the first thing to go was the flooring. I had scavenged Pinterest for ideas and kept seeing ceramic tile that looked like a hardwood floor. I LOVE the look of that and said it was a must for this bathroom since you can’t actually have wood flooring in bathrooms. We looked around and found a dark color at Lowe’s for $2.50/square foot. Luckily for us we ran across a coupon for 10% off total purchase so we ended up getting it for about $2.25/sq ft. 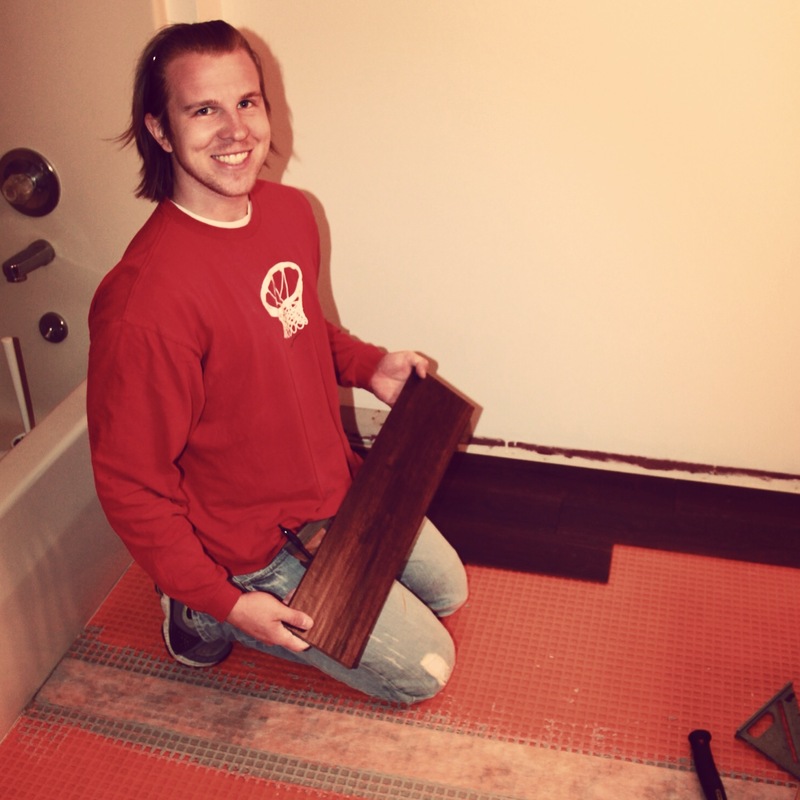 This was also our first tile job ever in our lives, so you could say it was quite the process, but in the end Ben did a fantastic job and we couldn’t be happier with the results. Here’s some pictures of a few of the steps. PS- linoleum we found out was the wallpaper of flooring and a pain to rip up! We decided to go with the Ditra method for underlayment instead of cement board. (The orange grid looking stuff is Ditra.) It was a few steps, but will help to keep the tile from cracking. My gracious Mom came one weekend to paint for us since I couldn’t being preggers. We went with a crisp white for the walls as well as for the trim. I wanted a modern grey, white and black color scheme for the bathroom. 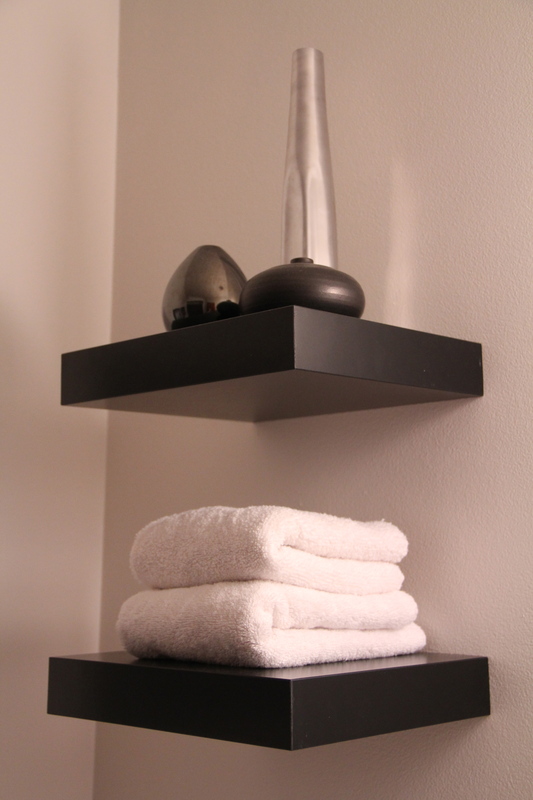 I ended up painting the vanity black and added black floating shelves from Ikea and black frames for my artwork. The pictures were some I had taken from our little slice of Heaven- Clear Lake. 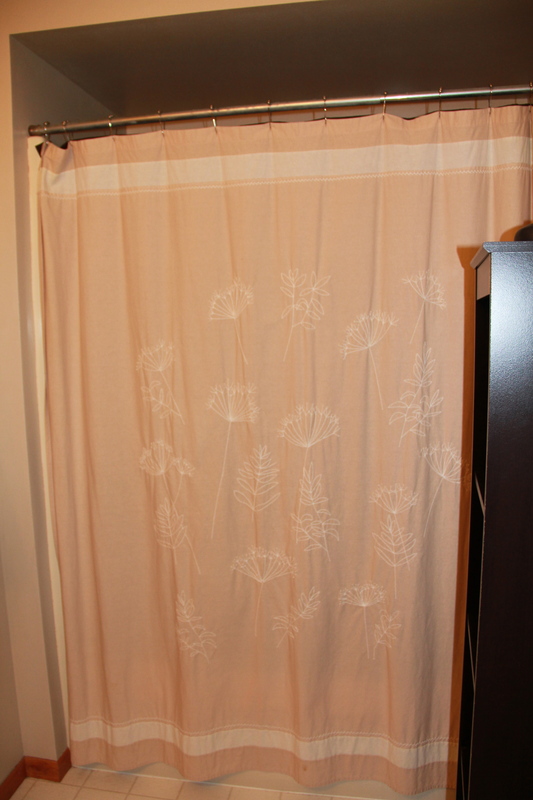 I had originally bought a new grey shower curtain when we moved in over a year ago. We’ve learned as homeowners that a lot of your ambitions and dreams take a little longer to come to fruition than originally anticipating. 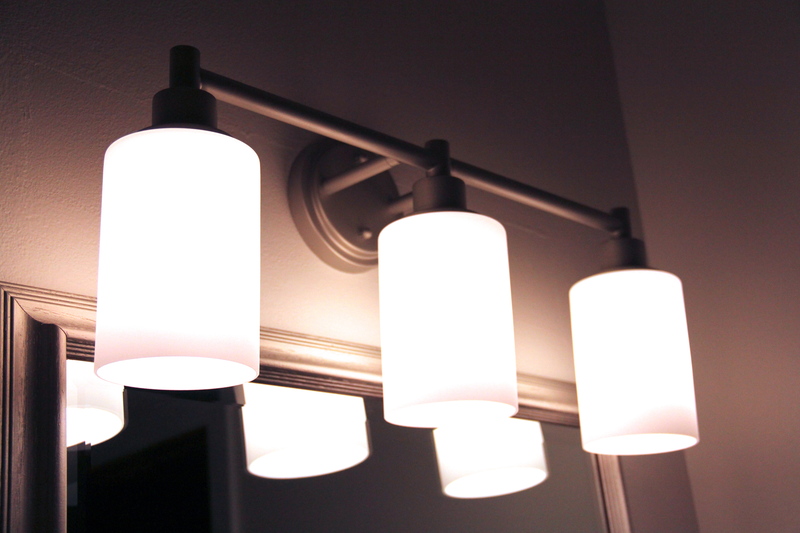 Here’s some of the shots of the new and improved modern bathroom! Didn’t Ben do a fantastic job on that floor?! We are loving it and would recommend it to anyone. 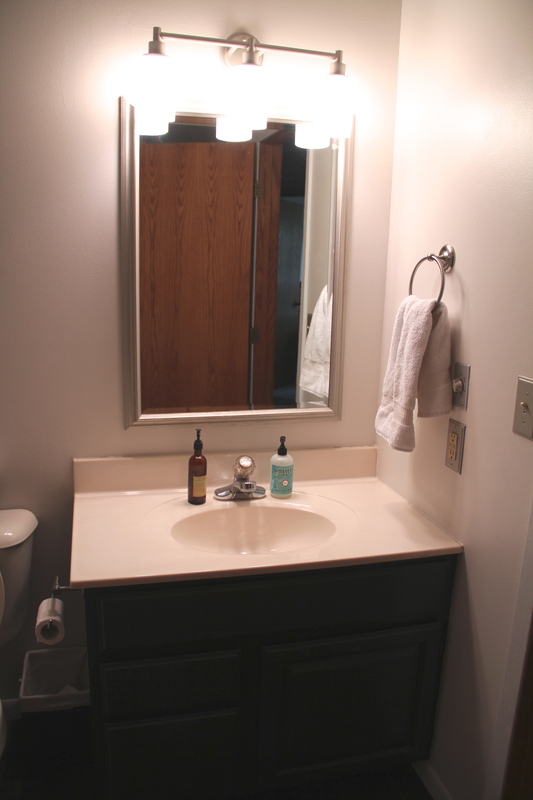 It might be hard to see, but I ended up spray painting the mirror, new light fixture and light switch plates a brushed nickel so that everything matched. Talk about cheap and an easy update. My Grandma bought the light fixture for us for my birthday. We found it at Menards for $40. It was originally a bronze color before I spray painted it. 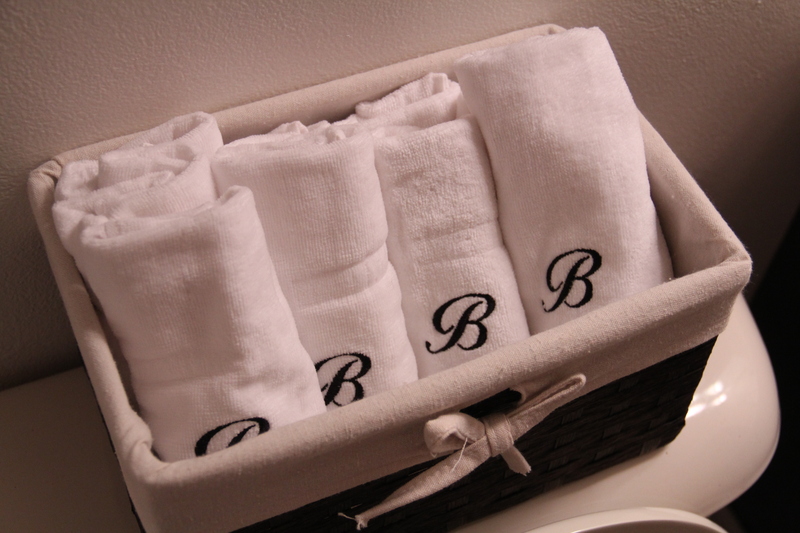 The basket on the back of the toilet is filled with personalized towels to be used for individual hand towels. The basket on the floor is where you throw it when you are done using it. I got this idea from my amazing friends Christina and Em. This helps for those who have problems using towels others have used, stopping spreading germs and apparently it’s very common in Europe. I love the idea and the look. It’s an improvement in our book and a space I’m not embarrassed to have guests use when they come over. Everything was able to be done on a small budget and all of it was DIY. 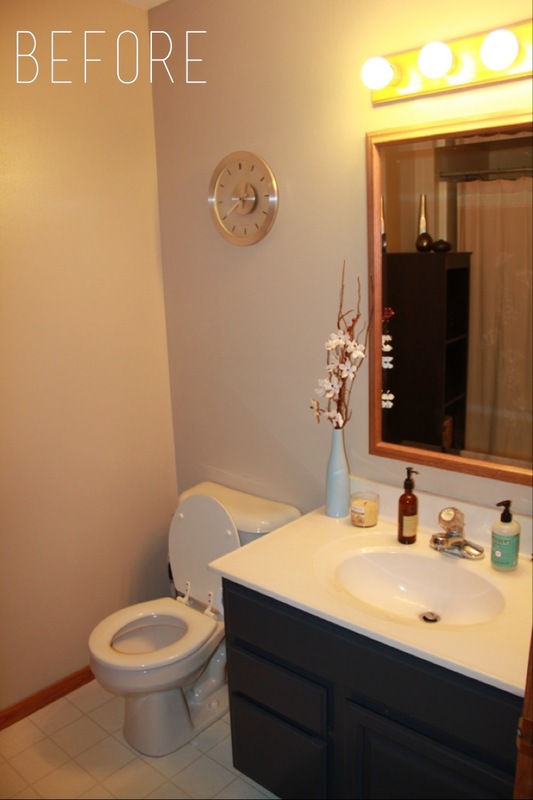 (A small shout-out to Darren who helped get the toilet back on, Mom who helped paint and Grandma for the light fixture!) 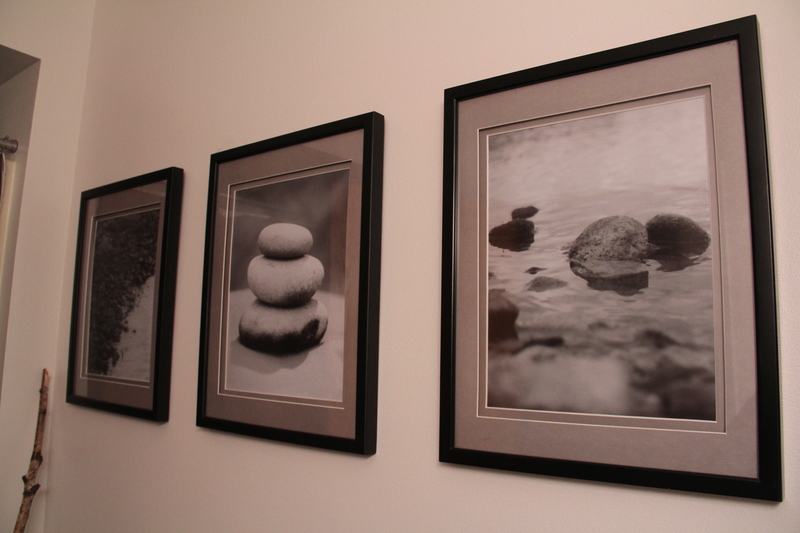 Another house project checked off our list…now onto Little Mister’s room. I promise to post pictures when that space is done as well. Hope this inspires some house projects for you! 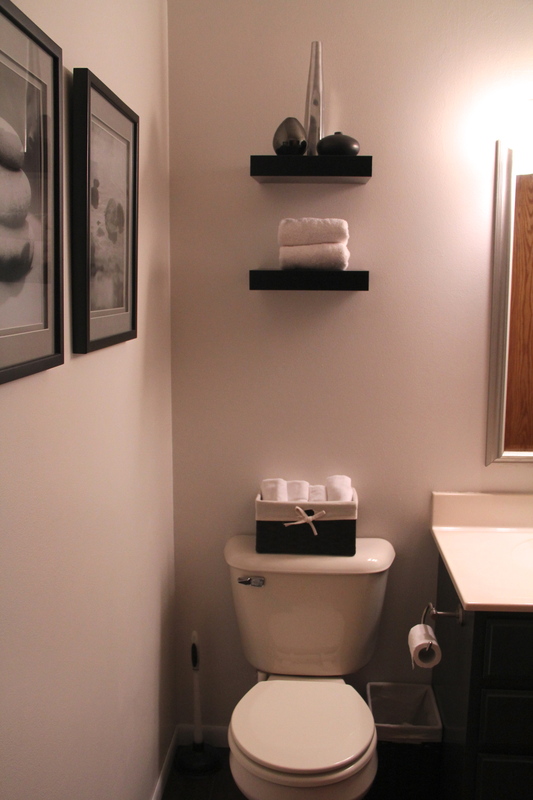 Pingback: More Small Bathroom Solutions | It's Tidy Time!